Simply brilliant! 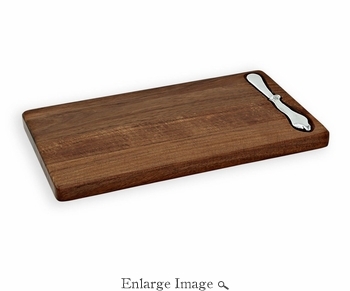 A silvery and sinuous metal spreader graces the wooden surface of this delightful rectangular cutting board. Rendered in a hand-polished decorative metal, and resting in a custom-fitted recess, the brilliant spreader stands out against the warm wood of this intimately scaled cutting board. Ideally scaled for small space living, and perfect for presenting your favorite cheeses or charcuterie in style. Made of an FDA safe, easy-care aluminum alloy, and polished wood.